For many years, way before it was a “thing”, we photographed our food. We like to take pictures of pretty things. 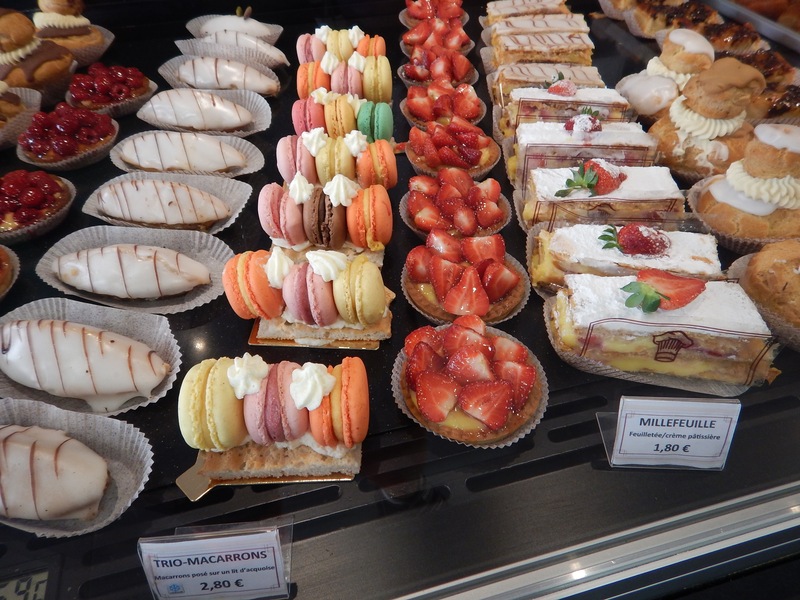 In France, they are all about the presentation, so there are many beautiful culinary sights to behold. I don’t think you will find it terribly fascinating to see every meal we have eaten (or would you? ), even though most of them have been digitally captured, so I will hit the highlights. We are on an extended trip with 5 weeks to spend in villas we have rented through VRBO (Vacation Rental By Owner, thank-you Mags McD). We plan to eat at home more than 50% of the time. All breakfasts will be at “home” and hopefully at least half of the lunches and dinners. This means shopping in the local supermarkets and visiting the local roadside fruit vendors as well as going to the local weekly markets. 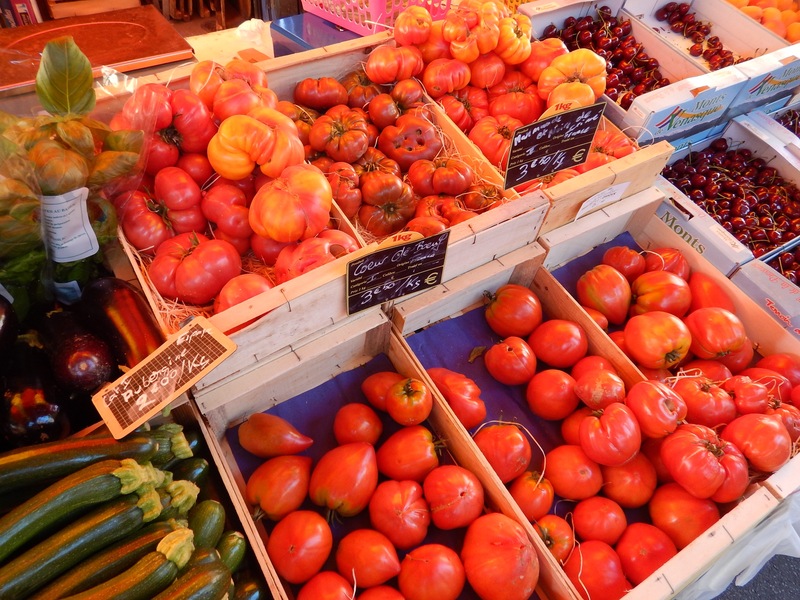 The French eat what is in season and what is grown locally. Perhaps at the end of 5 weeks we will be tired of cherries (never), strawberries, melon, apricots or tomatoes, but I don’t think so. It’s more likely we will tire of zucchini, or courgette if you are French, which is on every menu and most readily available at every roadside stand. 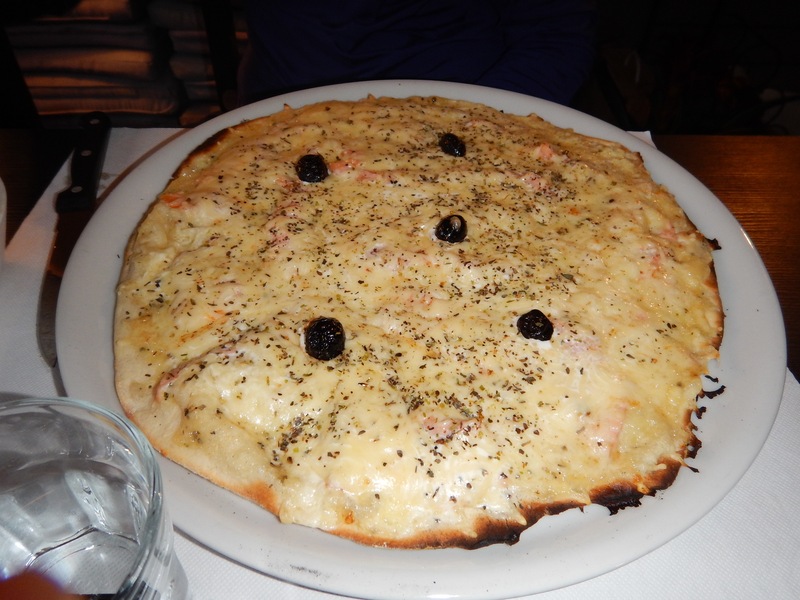 A go-to meal for us is pizza, and they do it well here in France. Sometimes when we order a pizza, we also share some sort of salad to try to keep things healthy! 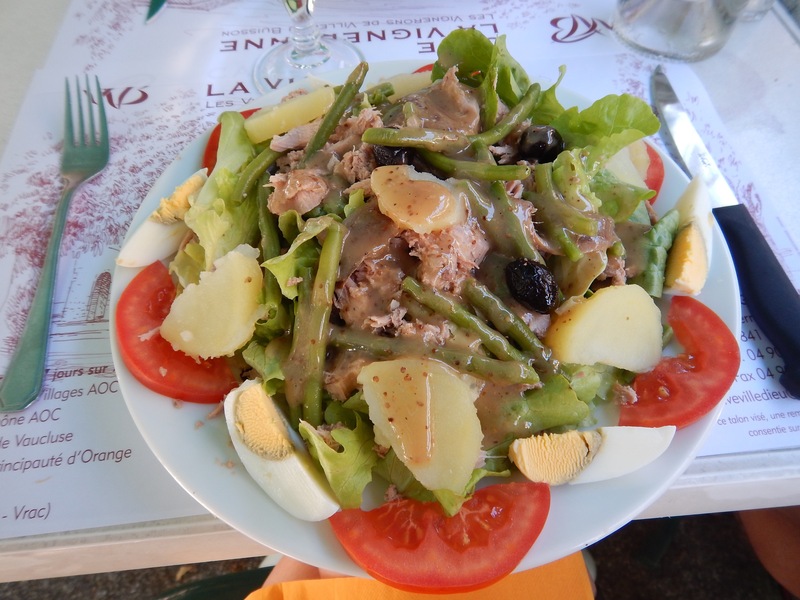 best salad nicoise of the week! 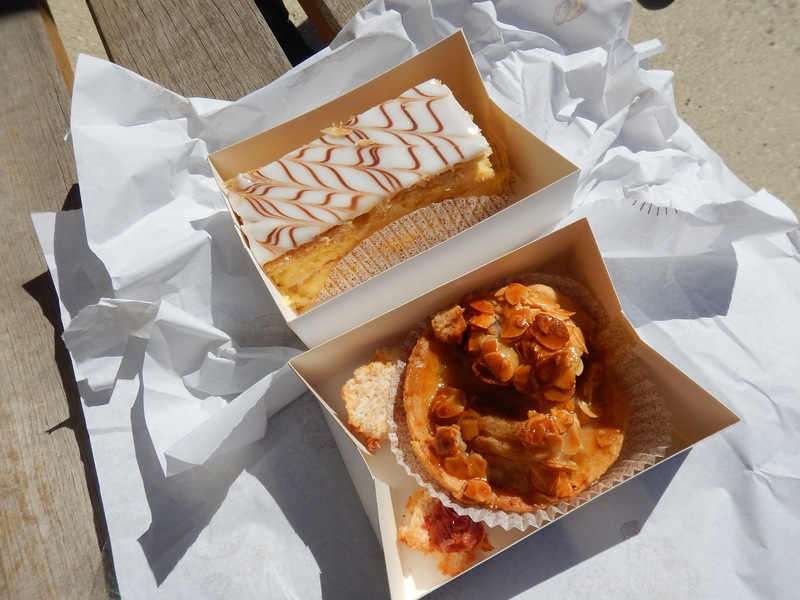 During bike rides back home we usually make our rest stops along the way at gas stations, but here in Provence we work rides around the patisserie. Even though our rides have been in the 30-mile range, we certainly deserve the delectable “rewards” that come “gift wrapped” for us. 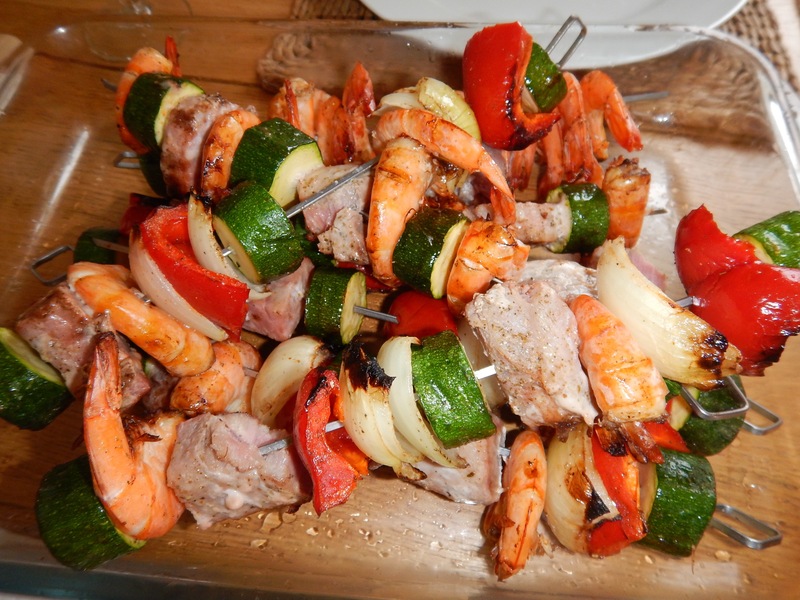 We have stuck with the plan to cook home and our most impressive home cooked meal consists of seafood kabobs made with ingredients we picked up at the market. 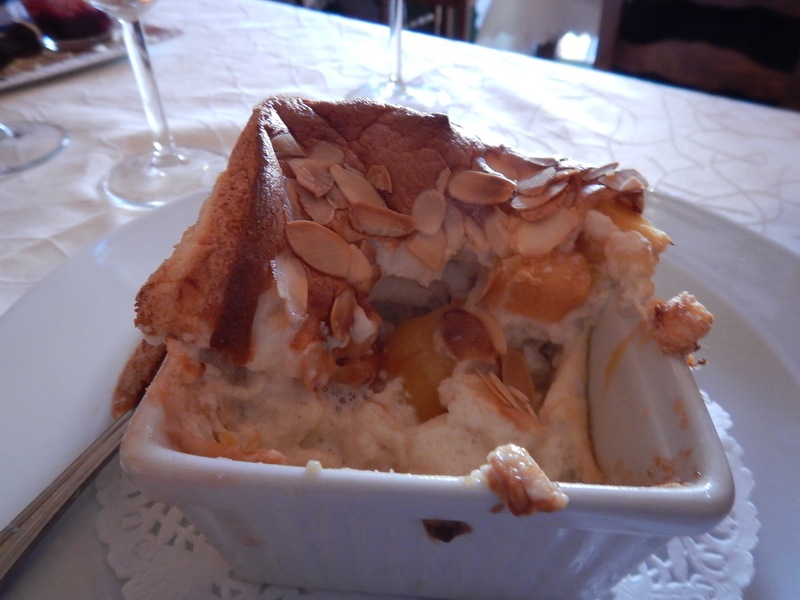 The best meal out this week is at Auberge la Bartavelle in Vaison-La-Romaine. It is like a wild goose chase to find it, but it was worth it in the end. We start with the chef’s choice amuse bouche which was a cold creme of carrot soup with olive oil and garlic. 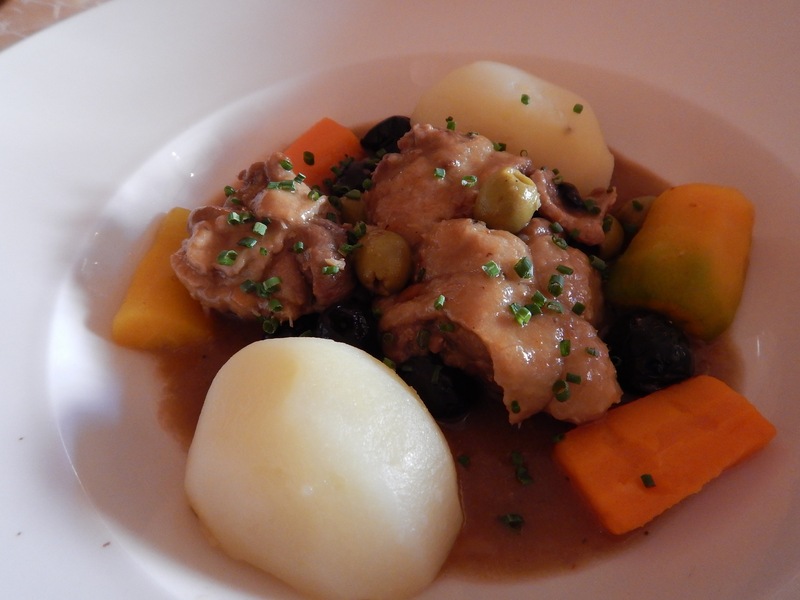 Roger orders the duck, which is served with potatoes and carrots. 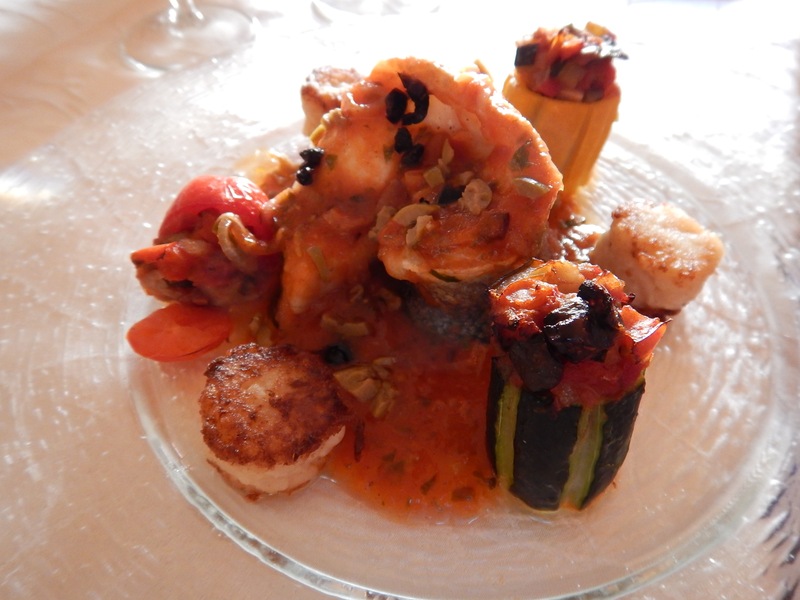 I get the sea bass, featuring perfectly carved and stuffed vegetables and medallions of potato. For dessert, Roger hits the chocolate. 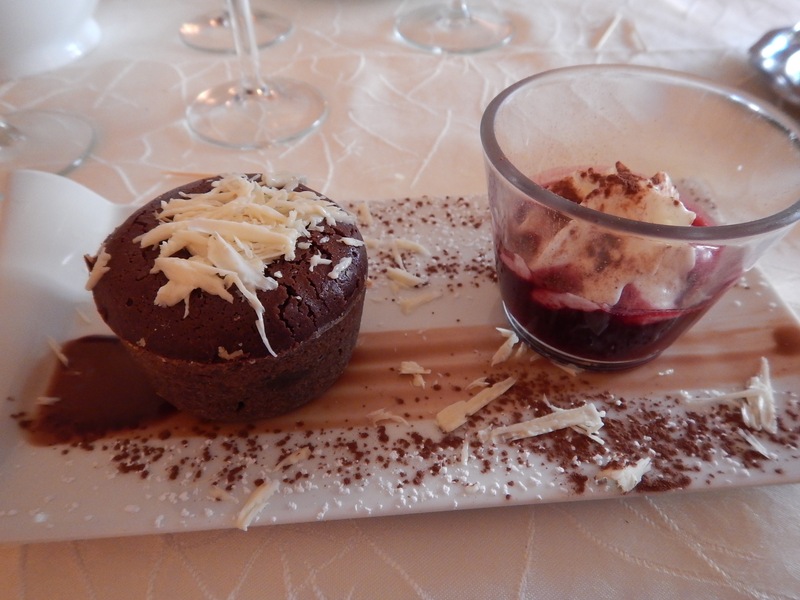 His ganache is filled with soft, rich chocolate and served with raspberry sauce on the side. I choose the magnificent peach surprise. 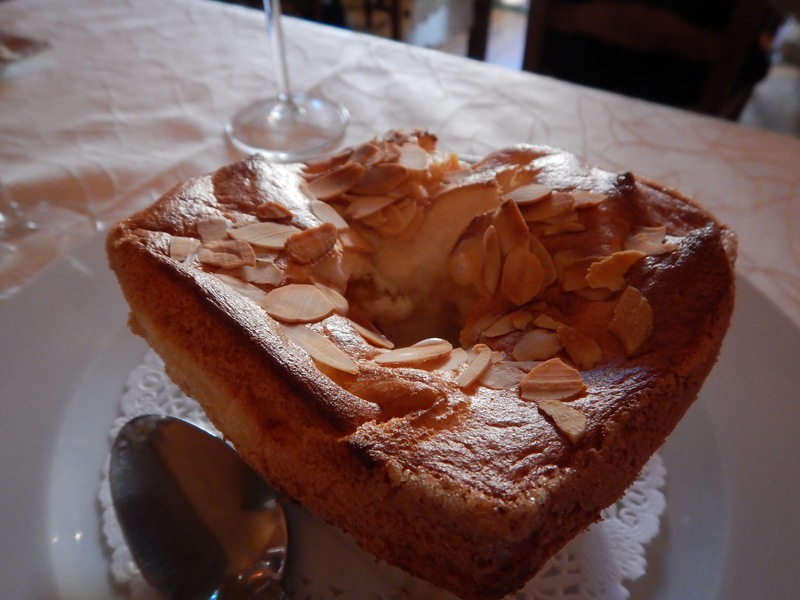 The pastry is light and fluffy and the server delivers it and then breaks the pastry to slide a scoop of vanilla ice cream inside. So much to eat, so little time. I’ll try to feature some of the culinary highlights again next week. Coming up, a look at the private villa we have been luxuriating in these first 2 weeks in Provence! Now I’m hungry… Terri what’s for dinner? Beautiful food! in beautiful settings. Enjoy!